Ace celebrated his 11th birthday last weekend. Now firmly entrenched in the tween years, he has left his childhood in the dust. The fact that my baby is no longer even a little kid has thrown me for a loop. Perhaps that’s why my thought life is taking a decidedly sentimental turn. Memories of the kids when they were small – the adorable and idiosyncratic things they did, the funny words they said, and the soothing rituals we shared – keep popping into my brain unbidden and at the oddest moments. While I don’t want to relive that particular period of my life (frankly, it was a lot of work), I’m certainly enjoying the warm fuzzies that come from remembering. Some of the sweetest memories I have are wrapped up in reading together. Snuggling with a picture book was wonderfully intimate and I especially looked forward to nap time and bedtime reading rituals. Each of my children had their favorite types of books. Lovey liked fairy tales, friendship stories, and Richard Scarry. Buddy preferred anything about heavy machinery, animals (especially frogs), and Curious George. Ace always wanted to hear about pirates, dogs, and history. I have my favorite children’s books, too. Unlike my kids, I don’t care as much about subject matter. Instead, the poetry of the words, the thoughtfulness and beauty of the illustrations, and the synergism of the two are the things that make a book special for me. A little kid story that has some grown-up concepts deftly woven in also gets a thumbs-up. And finally, a good dose of silliness is icing on the cake. You’ll find that my list doesn’t contain many classic children’s books. I don’t know why but I tend to gravitate toward lesser known but still wonderful little pieces of literature. The books below are arranged in order of age appropriateness only (youngest to oldest), not in degree of favoriteness. 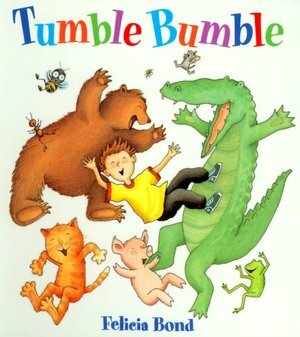 Tumble Bumble written and illustrated by Felicia Bond. A tiny bug starts out on a walk that becomes an adventure in accumulating new animal friends. The illustrations are simply adorable and the rhyming prose is catchy and filled with great descriptive words of all kinds. Tumble Bumble is reading fun, plain and simple. Unfortunately, it would seem I’m the only one who thinks so. None of my kids remember reading this board book even though it’s falling apart from use. 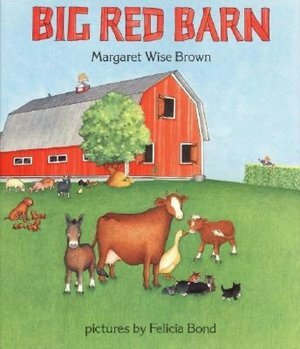 Big Red Barn written Margaret Wise Brown, illustrated by Felicia Bond. Margaret Wise Brown is probably best known for the classic Goodnight, Moon. Big Red Barn has the same quiet, soothing rhymes but is not as simplistic in content. The story, again perfectly illustrated by Felicia Bond, follows a day in the life of the farm animals who live in the big red barn. My board book copy has been loved to the point the pages are falling out. I think it’s the perfect nap time read for little ones. 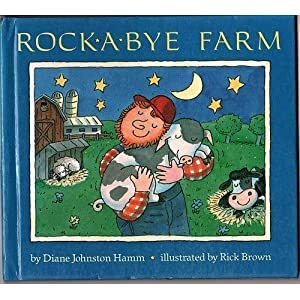 Rock-A-Bye Farm written by Diane Johnston Hamm, illustrated by Rick Brown. Miss Hamm has written the quintessential bedtime book. I don’t believe the version illustrated by Rick Brown is in print any longer which is a very sad thing. His quirky illustrations are a major part of the charm of the story for me. And what is the story? The Farmer takes time to rock his baby and all the farm animals to sleep before he rocks himself and climbs into bed. Very simple text and lots of repetition are great for inducing sleepiness. My favorite illustration shows the cow being rocked to sleep in the loader bucket of The Farmer’s tractor. A newer edition of the book is available with a different illustrator, but for me it just isn’t the same. Where the Wild Things Are written and illustrated by Maurice Sendak. What is there to say that hasn’t already been mentioned about this treasure? My own personal joy was listening to Ace growl and roar like a wild thing himself as a toddler while I read the story to him. Let the wild rumpus begin! 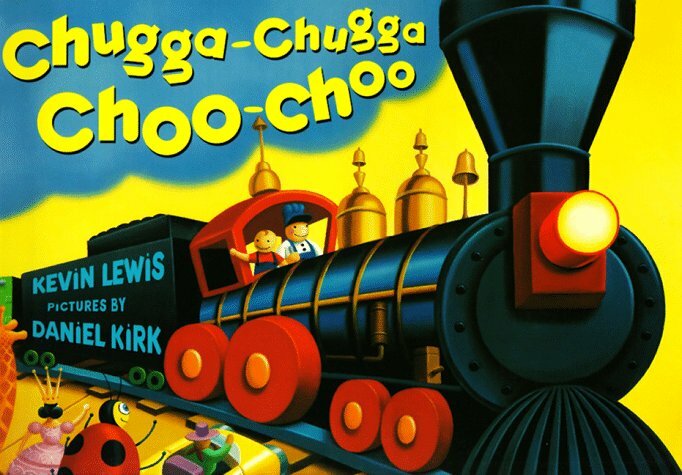 Chugga Chugga Choo Choo written by Kevin Lewis and illustrated Daniel Kirk. Before Kevin Lewis wrote this book, he worked as a children’s book editor. Chugga Chugga Choo Choo is proof that he knew the recipe for a great children’s book. The magic of his book lies in the combination of easy rhyming text with its rich use of onomatopoeia and the artistic primary color illustrations depicting a world of lovable, hard-working toys. Both of my sons were train lovers at one time or another, so this book got a lotta lovin’ from us. Me? I just liked making the train sounds. 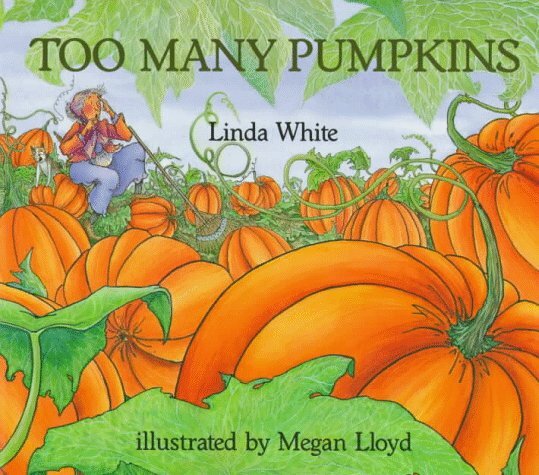 Too Many Pumpkins written by Linda White and illustrated by Megan Lloyd. When Ace was little, he called pumpkins “bupkas”, so in our family we have always called this book Too Many Bupkas. It’s the story of Rebecca Estelle, a woman with an intense and life-long hatred of pumpkins. When a farm truck loaded with pumpkins hits a bump in front of her house, a pumpkin falls out and smashes to pieces in her front yard. She decides to ignore it. The rest of the story is all about the consequences of that one decision. This is a very heartwarming story about transformation and personal growth, about taking something hateful and turning it into a worthwhile experience. 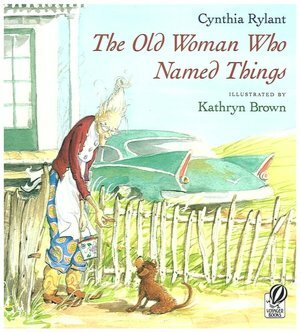 The Old Woman Who Named Things written by Cynthia Rylant and illustrated by Kathryn Brown. Cynthia Rylant is a prolific children’s writer probably best known for her Henry and Mudge books. The Old Woman Who Named Things tells the tale of a lonely old lady who only names things that will outlast her. These things include her car (Betsy), her house (Franklin), her chair (Fred), and her bed (Roxanne). When a small brown stray puppy starts hanging around, they develop a friendship and her naming policy is severely challenged. This is probably my favorite book in the list. The delicate watercolor illustrations are perfectly matched to a story that touches on concepts like loneliness, friendship and love. I get misty-eyed every time I read it. 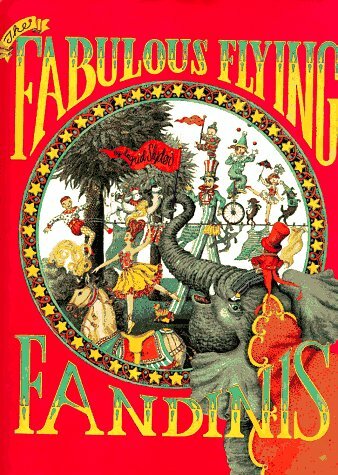 The Fabulous Flying Fandinis written (and illustrated ?) by Ingrid Slyer. In this fanciful book, Bobby’s new neighbors are a family of circus performers. They are forever trying to get Bobby, the “normal” kid, to try something new. For most of the story he refuses, but then finally changes his mind in a big way. I’ll admit that the main attraction for me is the illustrations. They are so detailed and whimsical. I don’t usually say this, but the words aren’t even necessary to enjoy and “get” this story. In my heart, I secretly wish I was Mrs. Fandini. 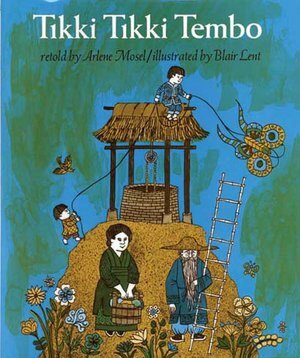 Tikki Tikki Tembo retold by Arlene Mosel and illustrated by Blair Lent. My Mom often read this book to my sister, brother, and me when we were young. Imagine my joy when I saw Tikki Tikki Tembo several years ago at the local Barnes and Noble. I did a little jig and then immediately bought it for my kids. In this Chinese folktale, the firstborn son, Tikki tikki tembo-no so rembo-chari bari ruchi-pip peri pembo, falls into a well and almost drowns because his long name slows down the process of getting help. Because of this almost tragedy, all Chinese children now have little short names. It’s a fun story to read out loud because Tikki tikki’s full name shows up at least 10 times during the telling of the tale. At one point, Chang almost passes out from lack of oxygen because he is so out of breath from running around and saying his brother’s name. As the narrator, I always empathize with poor Chang’s predicament. The spare and simple illustrations are funny and have a very Chinese-like style. They complement the story beautifully. I hope I’ll be forgiven for this very self-indulgent post. Writing about books I’ve loved reading to my munchkins has been a very pleasant distraction from reality. We all need that every once in a while. Give some of these books a try, if you haven’t already. I don’t think you’ll be disappointed. And stay tuned for Part 2. I’ll be writing about chapter books and novels I’ve enjoyed reading to my kids. Do you have any favorite children’s books you’d like to share? I really would like to read The Old Woman Who Named Things!! Thanks for sharing. It’s Book Week in school so this is really useful. Will go search for these at the library/book store. Who can resist a lady who names her bed Roxanne, right? I hope you enjoy it as much as I do. I will be adding that book to my list too 🙂 Good comeback Stephany! Have to agree with a bed named Roxanne! “Where the Wild Things Are” is one of my daughter’s favorites. It really gave me a warm feeling to see my daughter enjoy a book that I had enjoyed when I was her age. Right now I am recording myself reading some of our favorite kid’s books so she can listen to them when she is with her mother. That is a beautiful gift to give your daughter (and her children)! You are right. I had not thought of grandchildren. It is hard on my daughter having to wait for “daddy’s weekend” I just wanted her to be able to her my voice. I will record more things for her too. Thank you very much! What a great idea. I wish my ex would do this! My younger one misses him a lot. I am going through a rough time right now and if it were not for my daughter I would have called it quits already, packed a few things in a backpack and become one of those homeless vets they keep remiding us about. But I just cannot give up because of her. I know every dad says it, but there really is no daughter like mine. If everyone in this world had a heart like her’s armies, hate, and all the other bad things would be a thing of history … and she is only 7. True, true. The Velveteen Rabbit is probably a favorite of many. And for very good reason. Congrats on being Freshly Pressed! I was surprised to see once again that one of the Blogs I Follow did it. I always feel iffy having Frshly Pressed and some of my followers haven’t. The Old Woman Who Named Things is a great one. I basically go around and try to reenact her life every chance I get. Your comment made me smile. :)! Remember the Little Brute family and Boris and Morris? Yes, I remember them very well – especially the Little Brute Family and their little lost good feeling. Happy memories for us Hart kids (and parents). I thought you might mention Owl Babies, too, although that was technically a book for your grandchildren. Oh my goodness, Boris and Morris are legends in our house! We still quote them when we get a cold… “my one head is sore”. Big Red Barn was one of our favorites, too. Also The Seven Silly Eaters and Custard the Dragon. Ah yes, Custard – “a realio, trulio, little pet dragon”. Another very fun-to-read book. I’ve never heard of The Seven Silly Eaters, though. So many good books, so little time. Thanks for sharing! The Seven Silly Eaters is a great book. Also another favourite for my son is “There are Monkeys in my Kitchen”. Chugga Chugga Choo Choo is still read often. I’ll tell them that on a regular basis. 🙂 Thanks for stopping by. It’s a newer one, but my son loves Chicks and Salsa. It’s a fun read. My daughter (now 5) is onto Charlotte’s Web. Not a picture book, but still a great MG read. Charlotte’s Web. With Wilbur, and Fern, and Templeton. Those are great memories from MY childhood. Just the name Chicks and Salsa sounds fun. I was only familiar with one book listed here. Thanks for the other suggestions. I know just what you mean about getting nostalgic about children’s books. I have a pile of ‘special’ books that I couldn’t possibly get rid of as they have too many memories. I love the idea that my daughters might read the same books with their children that I read with them. Like you, I didn’t generally go for the classics but once, when I tried reading Oscar Wilde’s ‘The Happy Prince’, I couldn’t finish it because I was sobbing too much. Now I’m going to have to read The Happy Prince. Thanks for your input! My son loved Where the Wild Things Are so much he was Max for Halloween….and then stayed Max for several weeks after, too. Too Many Babas was another favourite, all about too many cooks spoil the stew. This was a favourite because it was the first one where I used different voices for all the babas/cooks. This book is out of print so I bought it used on Amazon. There are so many favourites…thanks for sharing yours! You’re welcome. I’m really enjoying reading everyone’s suggestions. Some of my books are out of print, too, so I’m very glad I tucked them away them when I did. Even as adults, children’s book can be so magical! My childhood favorite was Chicka Chicka Boom Boom…I can still hear the words in my head! And who could forget the Shel Silverstein Poems? Shel Silverstein is a great example of the synergism of words and illustrations. Each part stands alone very well, but when combined together they make something fabulous. It sounds like your guys like rhyming words. I haven’t heard of any of those books so I’ll definitely to check them out. Thanks for sharing! Tikki Tikik Tembo is my favorite book! I have so many memories of reading it as a child. Whenever I need to buy a book as a gift, this is the one I buy! I loved when my Mom read this to us because she was very dramatic, pretending to run out of breath and such. The illustrations always fascinated me as well. I’m tickled that so many other people have happy memories of this book. My boys and I have read Too Many Pumpkins more than a hundred times!! Excellent! It is such a great book. Glad to hear you like it – probably even more than my family. 🙂 Thanks for reading. I am intrigued. I will definitely be looking into your suggestion. Thanks for sharing. My daughter is 3 1/2 and she loves Where the Wild Things Are. We read it at least 4 times a week. I broke down and bought her the movie but she said she likes the book better! YAY! I have not seen the movie (yet) but I will probably be agreeing with your daughter if I ever do. With Maurice Sendak’s illustrations, how can the book not be better? Lovely blog. I also have fond memories of reading I love Charlip Remy book. Do you remember “Fortunately Unfortunately”? Thank you. I’m not familiar with either book you mentioned so I will definitely be seeking them out. I appreciate you input. Thank you, Stephany. Picture books are one of my favorite things.Mmy kids are getting big, so I relate to your feelings. Whenever I get a chance to work with preschoolers, I get to return to these simple, wonderful treasures. You’re welcome. I don’t have too many little ones in my life right now so I’m really missing reading good picture books. You are very lucky. My son loves Duck on a Bike by David Shannon. It is really cute and funny and I enjoy reading it too! I never heard of Duck on a Bike so of course I Googled it. The illustrations look hilarious. Thanks for sharing. oh my goddd tikki tikki tembo!!!!!! such a classic! same with where the wild things are. That’s about how I responded when I first saw Tikki Tikki Tembo at the bookstore. THanks for reading and taking the time to comment. Wonderful post and a great list of books to read to any child. Congrats on the Freshly Pressed. Thinking of the Frog and Toad books (the mention of one of the boys liking frogs). Know it’s easy reading but sometimes it’s good to have the kids read at a lower level to help get those basic grammar skills set in the brain and keep the joy of reading alive with an easy read. My nephew (7) is reading comic books. I know that the words are above his comprehension but great to see his love of books continue over the years. We always buy books for gifts, have been doing it for quite some time now. My brother sent me a picture of the oldests’ reading to the youngests’ paired up on the couch one Saturday morning… 4 kids in that family! My favorite are the Don and Audrey Wood books, Seuss (of course) and just uncovered my Sweet Pickles books which I’m sharing with the nephews and niece now. My son Buddy (who is 13) devoured the Frog and Toad books when he was learning to read. He’s going through a stage right now in which reading isn’t cool. It makes me so sad but I’m sure he’ll come around. When you mentioned the Sweet Pickles books, I almost fell out of my chair! My sister had the whole collection when we were little. I had completely forgotten about them. Good memories! Yes, I still have the collection of Sweet Pickles. Pretty sure I had a board game too but that was probably sold at one of the many tag sales we had. My brother’s kids have an amazing library and I’m happy to say I’ve helped it grow. I know what you mean about quoting books as a family. They become like inside jokes and create a secret family history. I’ve never read Going On a Bear Hunt, but I recognize the cover. Thanks for taking the time to read and comment. Everybody reads to our grandkids and they are between nine and three.Even the oldest who is an avid reader herself will stop to cuddle up and listen when the littler ones are being read to.They just love the book Yours Truely Eloise and any of the Llama Llama books. Isn’t it wonderful that reading to children is something that can be shared with the whole family? Thanks for sharing this list. I have a 19-month-old little boy, and we are just tapping into some of these books. I’ve heard and read about half on your list to him, but plan to look for some of the others at the library. Thanks, again! You are very welcome. Thanks for taking the time to read and comment. Both of my kids could recite “Llama Llama Red Pajama” while I read it to them. I originally picked it up as a bedtime story because Llama falls asleep at the end, but it turned out to be the most enjoyable part of my day. It sounds like the Llama Llama books are loved by many people. Thanks for sharing. This is a great list. My children are starting to outgrow illustrated books and seeing your list brought back some good memories. I enjoy some of the same books on your list and realize what kind of universal stories good children’s books share. Congrats on the FP too! Thanks! I’m also amazed at the strong connections so many of us have with the stories we read to our children or the stories that were read to us when we were little. It is fascinating. I wonder if the Old Lady who Names things is related to the Old Lady who Isn’t Afraid of Anything? The latter is a favorite, and I plan to read the former. Thanks for the memories! The Little Old Lady Who Wasn’t Afraid of Anything is one of our favorites, too. It just didn’t make the cut for this post. It is a spooktacular and not too scary read for Halloween. Thanks for taking the time to comment. Love this post! I don’t have kids yet, but I work in a small library with a large picture book collection so have seen and read many of them. My favorite obscure children’s book was always Pigs in Hiding by Arlene Dubanevich. I’ve never heard of Pigs in Hiding. Does it have anything to do with the Three Little Pigs tale? No, it’s about 100 pigs playing hide-and-seek. The one who is supposed to be “it” is terrible at looking. Even though there are pigs hanging off the chandelier and in the pillowcase, he always says “Well, none of you guys hid in here” for every room. My dad always shortened it to “No pigs in here” when he read it. It’s a hoot. Very charming illustrations too. I was a Dr. Seuss kid. Though I remember finding the rhythm and quirky illustrations engaging, my favorite part of story-time was listening to my aunt, mother or teacher furiously stumble through the tongue twisters while I cackled at their frustration. Yeah, my kids have gotten some pretty good laughs from listening to me read Dr. Seuss. It’s the price I willingly paid for being the favorite parent. (Just kidding) Thanks fo sharing. My son is going to be 22 next month…thanks for reminding me about “Where The Wild Things Are!” We still have it, and one of the stuffed creatures that goes with it! His favorite, for sure! I should get it out again!! You’re welcome. And ,yes, you should get it out again. Thanks for taking the time to comment. Ah – where the Wild Things Are – that’s a book from my childhood! Have the movie & still haven’t got to watch it! Glad to see its still a popular childrens book! Thanks for sharing! I’m glad to see there are some classic children’s books on here and not all new ones. There’s something to be said for passing the classics along to a new generation and hopefully they will continue in the spirit and pass them along to their children. Great insight. I think passing favorites from generation to generation within a family is one of the most meaningful ways books become and remain classics. I apologize for being so late to post our comment. It was orginally sent to my Spam bin. I’ve never heard of Moon Jumpers but anything illustrated by Maurice Sendak has got to be good. Thanks for reading and commenting. We’ve done our fair share of reading both of those books, especially Go Dog Go. Loved the dog with the goggles in the racing car. Thanks for reminding me. You can find Tumble Bumble and Big Red Barn in board book format – great for little page crumplers. 🙂 Voting done, too. Thanks for reading and sharing. My absolute favorite book that I’d read to my son was Love You Forever, by Robert Munsch. I would read it over and over to him. My baby is going to be 11 in about a month- I’d still read it to him if he’d let me 🙂 Some of my best memories are of us reading together too. I cannot get through that book without crying. Thanks for sharing a very sweet book. Two books I’ve never read. Thanks for sharing! Some of these were on our favorites list as well. I’ve always loved reading to my kids and still do. Now they’re on to chapter books and it’s great that we can take turns reading to each other. Sometimes we’re cuddled up for a half hour at night just reading, not able to put the book down. It’s the best time of day. Congrats on being Freshly Pressed! Thanks, it’s been a wild ride. When my kids outgrew picture books, we started reading chapter books and then real novels together after everyone was tucked in. I agree that it’s the best part of the day. Two great (newer) books we shared with our kids over and over: “I Love You, Stinky Face” by Lisa McCourt and “The Hoppameleon” by Paul Geraghty. So wonderful to read aloud, with so much going on besides just the words you read! They sound like books that would have been right up our alley. Thanks for sharing. As a child, I really enjoyed “The Little Train that Could”. It gave me inspiration to try harder even if the odds were against me. My absolute favorite has been Dr. Seuss and his ability to play with words. I read One Fish Two Fish Red Fish Blue so many times to my niece ( before I had kids of my own) that I can still recall word for word most of that book. Dr. Suess is another great author/illustrator that deserves every bit of recognition he receives. Thanks for you thoughtful post. Found your blog on the Freshly pressed – congrats! I am a voracious reader and going back to childhood favorites also has a calming effect when times are tough (I don’t have kids). When I saw your Tikki Tikii Tembo – I immediately started to hear the whole name (well part of it!!) in my head and I don’t know when I last read it – at least 30 years ago! Your son may like at this older age the Great Brain Books – while set I believe in the 20’s or 30’s love the ingenuity of JD and his brother.. very imaginative! Great blog – can’t wait to read Part 2! I don’t know what it is about Tikki Tikki Tembo’s name but once it gets in your brain, it never comes out. 🙂 All of your suggestions are great. Thanks for taking the time to read and comment. Tumble Bumble was one of my son’s favorites. I’m so happy someone else loves this book. I think it is absolutely adorable! Thanks for stopping by. Thank you for the great post. A favourite we had with on child was ‘Shhhhhh!’ by Sally Grindley (I think). It’s a Jack in the Beanstalk interpretation with wonderful illustrations and flaps through to the next page, always going Shhhhh! to avoid waking the giant. The last flap opens the opposite direction and the giant’s eye is behind it. You then have to quickly slam the book shut to avoid the giant. Wonderful, wonderful book. One weekend we had to read it about 300 times. with the child inventing and re-inventing the story, coming in at different points, saying the giant appears too early etc. I wish I had a video of all that it was a real lesson in learning to read. He began to read words on the page about a week later. Our disappointment was when we tried to purchase the book. The copy which arrived had been slightly changed, it had become didactic and preachy in tone, the illustrations had been tampered with, the ending missed it’s mark….it was a great lesson in what makes a great book and what doesn’t….you just have to wonder what was going on there! I’ve never heard of your book before. I’m sorry for your experience. It’s very disappointing when your are expecting one thing from a book and you get another. Rock-a-bye Farm has new illustrations – I guess the ones we loved were too dated? But the newer version just isn’t the same story for me. Sometimes books (and other things) don’t need revamped. They’re perfect the way they are. Thanks for sharing. I am more aware of that every day. Such a great list! I’ll have to check some of these out. My mom sent me boxes of the books that she used to read to me when I was little. When I was packing them up for a move it was such a great distraction to re-read some of my favorites! That’s wonderful that your Mom saved and then gave your books back to you when you were older. I’ve saved many of our favorites but I don’t know if I’ll be able to part with them when the kids leave the nest. Thanks for sharing. The Tiger Came to Tea was our favourite for years! Great book! Thanks for sharing. The Big Red Barn and Where the Wild Things Are were big hits in our house. Now my kids are older and have talked me into writing my own children’s books. I hope some fond memories will be made with little ones and their parents when reading them. I hope so, too. That would be a lovely reward for your hard work and creativity. Thanks for stopping by and commenting. Stephany, Thanks for this wonderful selection of children’s books. I am drawn to the Old Woman Who Named Things and Too Many Pumpkins….first, for myself, then as a gift for my young niece….A few books you might enjoy are The Seven Chinese Brothers, Riki-Tiki Tavi, The Little Train That Could, The Rainbow Fish, and In For Winter, Out For Spring. However, there is one story I always told to toddlers when I worked in pre-school and they adored it. My grandmother told me his story. STONE SOUP which centers around an elderly woman who travels to different villages with a kettle. Each village she enters magnetizes towards her openness and warmth, and she magically entices the villagers to add an ingredient to the pot, settled on an open fire, which results in a magnificent succulent soup. Great message in the story. I agree with your Stone Soup suggestion. Excellent choice. Thanks for taking a peek at the blog. I have fond memories of our school librarian reading us Rikki-tikki, she used to do the dramatic version too. I was a Velveteen Rabbit girl. But in truth, anything my dad read to me was a winner at the time and still is – those books have a little permanent hidey hole in my book case. I worked in and helped set up the children’s section in one of the Borders stores. Unpacking those boxes was like Christmas for days and days and days. I love how so many of these books have stayed in print for generations. Your comment had me smiling from beginning to end. I don’t think I’d be able to work in a bookstore because I’d just want to read all the time. Thanks for commenting. Thank you for a list of books that we have yet to discover (apart from Where the Wild Things Are). I am particularly interested in The Woman Who Named Things – looks marvellous. I am still enjoying reading with my daughter and really hope we can do so as long as possible… I can’t bear thinking about the day when this will stop! I’ve never seen the movie but I’ve heard it was very good. It is a truly great story. I love Tikki Tikki Tembo! My older cousin would read it to me when we were younger and I read it to my niece now. Great to see that on the list. I’m not familiar with all of them but they sound like nice choices. I’m surprised at how many commentors really love Tikki Tikki Tembo and how much of a generational thing it is (which is fabulous). Thanks for sharing. Hi – I thought that I’d share a NEW favorite children’s/family book. “Petunia goes wild” by Paul Schmid. It is simply FUN. I love all the books you listed. I’m thrilled you liked the post. And I will definitely be checking out Petunia Goes Wild. Thanks for the suggestion. There is nothing like the pleasure gained from reading a book to your child, especially at bedtime. My oldest daughter is 4 years old and about to start school. We recently loaned “It’s Quacking Time!” out of the local library and she loves it…we have been reading it every night and I can see why. Great illustrations and a lovely story. So much pleasure did I get from reading to my daughter that I was inspired to write my own children’s book “Pippo and Poppy go to the Seaside/Pippo e Poppy vanno al mare”. It is a bilingual book (and Nook App) in English and Italian and, in my humble opinion (and that of all my family and friends), the beautifully illustrated story of a lovely day. I have already seen it brings a smile to a child’s face that quickly spread to mine as I saw my wish come true. Congratulations on being freshly pressed! Thank you and thank you for sharing about your children’s book. I can only imagine how rewarding it must be to see children enjoying the story. Thank you Stephany, it was a very rewarding moment indeed. Another favourite that springs to mind after reading all of your replies is The Hungry Caterpillar. My eldest daughter was reading this as soon as she could turn the board book pages herself! Again, welll done on such a thoughtful blog. What does freshly pressed mean and how does a blog earn that honor? I know a few blogs that certainly deserve it! There is some amazing stuff in this little world I have just discovered! Freshly Pressed blogs are chosen by the WordPress editors to be highlighted for about twenty-four hours on the home page of WordPress. While I don’t believe the Freshly Pressed blogs are necessarily the best of the blogging world (Whimsey Pie certainly isn’t), I think they are a good sampling of the types of blogs out there and the topics being discussed. The criteria used for choosing blogs seems a bit sketchy as there doesn’t seem to be any rhyme or reason to it. I think I just I happened to write about the right topic at the right time when an editor happened to be reading. The words fate and magic come to mind. I’m incredibly honored that someone read my post and felt it was worthy of being Freshly Pressed. I have loved reading and responding to everyone’s comments even more. For me, the best part of being Freshly Pressed is reading what others have to say. WordPress has been regularly discussing Freshly Pressed more in The Daily Post (at the bottom of the home page) if you are interested. It saddens me that at 20 years old, the only one of these books which I recognise is ‘Where The Wild Things Are’. Do things really change that quickly? I grew up on ‘The Jolly Postman’, ‘The Hungry Caterpillar’ and ‘Green Eggs and Ham’. Isn’t it wonderful though that even though so many books have already been written, people are still able to write something new that will be loved by a whole generation. No doubt my children will know the stories of my childhood, but they’ll know the stories of their own too. Great post! Thanks! I’m not familiar with The Jolly Postman, but the other books you mentioned are still going strong. I agree that it’s wonderful how the human imagination can continue to create original stories. The Story of Ping – which I also read as a child. A story about a duck that gets lost on the Yangtze River. All of course Dr Seuss! I remember one of my teachers in elementary school reading PIng to us after lunch. Thanks for taking the time to share your thoughts. I love so many! Sam, the Clever Carpenter, anything by Sid Flieschman–but particularly the McBroom tall tales and all of the Eyewitness Series. Chess for Very Young Beginners–we wore that one out. Congrate on being freshly pressed! Oh, wait!! Pigs Aplenty, Pigs Galore. Fabulous! Wow! So many suggestions I’ve never heard of before. I wish I would have known about Chess for Very Young Beginners. It would have been a hit in our house. Lovely post. When my now teenager was younger, there was the battered copy of Goodnight Moon which he loved. Now we still share books. He recently read The Hunger Games series and loved them so much, he encouraged me to read them. I did and we were able to have good conversations about the plot, lessons, characters, etc. Thanks! And I agree with everything you said. I love sharing books with my kids now that they are older. It’s a great way to keep the lines of communication open during the teen years. We love that book. I have read it so many times that 8 years later, I can still recite it by memory. Isn’t it just the most adorable book ever? Thanks for sharing. I do, too! Thanks for stopping by the blog. Terry Gross (“Fresh Air”) aired an interview with Sendak just after he passed away that was amazing. Made me love WHERE THE WILD THINGS ARE even more. I’m sure it’s archived if you want to hear it. Thanks for the comment. I’ll definitely be searching for that interview. I remember some of those from when I was a kid – especially Sendak. Also Richard Scarry. Wonderful! Thank you for sharing. You’re welcome. Thanks for commenting. I love Quack Counts to 10 and GOSSIE!! Two more suggestions I’ve never heard of before. Great! Thanks for sharing. I have been looking new kids books, what a great list. Thanks! Many of the other commentors have great suggestions, too. Thank you for your beautiful post. I am reading it on the last night that my two little boys, now 18 and 21, will be home before the coming semester. They will both leave for their respective college towns and dorms in the morning. It should be old hat to me now because it’s my older son’s junior year of college, but with the younger one leaving it signals the transition to a new phase of life for us all. This time tomorrow evening, my husband and I will be at home without our sons. It’s exciting and it’s a little bit sad at the same time. We, too have measured the years by much-loved books. Once again, thanks for your post. “We, too have measured the years by much-loved books”. Great classic story! Thanks for sharing. I’m a collector of children’s books (159 and counting) and this post makes me SO excited to have children! I took a peek at your blog. You have a great collection going – Babar, The Frog Prince, Mickey in the Night Kitchen. I always thought if I ever had a baking blog I would call it In The Night Kitchen. My youngest son loved The Fire Engine Book and my daughter loved Rapunzel with illustrations by Paul Zelinsky. Your children are going to have one heck of a library! I love reading and collecting books; but for Children’s book selection. It’s new to me. I am an expecting mother and thank you very much for sharing with us your experiences. Anything by Robert Munsch. And Peter Pan! Somehow we completely missed Robert Munsch. Peter Pan, on the other hand, has been very popular in our house. Thanks for your suggestions. I second this: I still have a copy of “Love You Forever” by Robert Munsch up on my shelf — a true children’s classic. Nice post. I understand the age-order thing, but I have to confess to reading ‘Where the Wild Things Are’ to my son (also now 11), when he was a few days old! I suspect i got more out of it at that time than he did, but he seemed to enjoy being cuddled and hearing my voice, and giggled at the bouncing around he got when the wild rumpus started. All the best. What a wonderful confession! I read to my babies, too, because I just couldn’t wait until they got older. Thanks for taking the time to comment. Although I have no kids of my own to read to….I loved reading to my nephews. I have to say – one book that really resonated with me as a child, and I still talk about to this day, is The Giving Tree, by Shel Silverstein. I still think about it….30 some years later and the message is still beautiful. Long live books! Agreed! The Giving Tree is a beautiful book. And frankly, anything by Shel Silverstein is a pleasure to read out loud to children. Thanks for sharing! It’s all cruddy from when I was little! Thank you so much. I love reading about your travels! Reminds me of some of my favorite, especially Tikki Tikki Tembo. Have you ever read Tailypo? It`s a children`s ghost story and it`s amazing. I’ve never heard of it. Thanks for the suggestion – I will definitely check it out.